Tree ferns are one of the most ancient of plants. Ferns with erect trunks are commonly known as tree ferns. 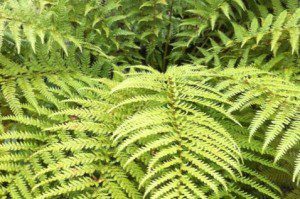 The best known of all tree ferns is the Australian and Tasmanian fern, Dicksonia antarctica. 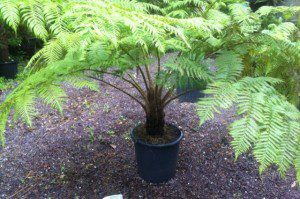 We sell both Dicksonia and Cyathea species. Tree ferns are found growing in tropical and subtropical areas as well temperate rainforests in Australia, New Zealand, and other Pacific island groups. Cyathea dealbata is a very beautiful tree fern. It is a slow grower eventually reaching a trunk height of 10 metres or more and has a stout, thick woody trunk up to 45cm in diameter. Dicksonia antarctica is the best known of all the tree ferns. It has been grown in Britain and Ireland for years for its ease of cultivation, great beauty and proven cold-hardiness. 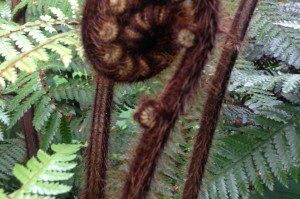 This is the Tree Fern for the beginner gardener to start with! It ticks all the boxes on price, size, its easily available and the hardiest one on the market. Dicksonia fibrosa is a smaller species of the Dicksonia genus from New Zealand (North Island, South Island and Chatham Island) that looks almost like a miniature of Dicksonia antarctica. It grows in formidably cold areas of New Zealand, at elevations up to 900 metres. The trunk develops rather slowly and attains a mature height of up to 6 metres. Dicksonia sellowiana comes from from South America (from southern Mexico all the way down as far as Uruguay) can now be rated hardy along with lines of Dicksonia antarctica and Dicksonia fibrosa. It’s trunk height can grow up to 10 metres which is very fibrous and similar in this respect to Dicksonia fibrosa. Dicksonia squarrosa is an extremely elegant and exotic looking Tree Fern from New Zealand (North Island, South Island, Stewart Island, Chatham Island, Three Kings Island). It has a very slender dark trunk up to 7 metres (22 feet) tall, in its native habitat, covered in yellowish-brown hairs. Dicksonia youngiae is another Australian Dicksonia species that is endemic to the rainforests of New South Wales and Queensland. To the unaccustomed eye it is not dissimilar to its NZ cousin, Dicksonia squarrosa.